Sure, dogs may not always wear capes, but they have a superpower — their superior sniffers. “They have up to 300 million olfactory receptors in their noses, versus only about 6 million for us. The part of their brains dedicated to interpreting smell is about 40 times larger than ours,” says Michael Nappier, an assistant professor at the Virginia Maryland College of Veterinary Medicine. “While we might notice if our coffee has a teaspoon of sugar added to it, a dog could detect a teaspoon of sugar in a million gallons of water, or two Olympic-sized pools,” writes Alexandra Horowitz, the author of Inside of a Dog: What Dogs See, Smell, and Know. Cybil Preston, chief apiary inspector for the Maryland Department of Agriculture, does a training run with Mack. She sets up fake beehives and commands him to “find.” He sniffs each of them to check for American foulbrood. If he detects the disease, he is trained to sit to notify Preston. Photo by Morgan McCloy. That's why canines can sniff out American foulbrood (AFB): the most serious bacterial disease impacting honeybees. Reported in the United States since the 1930s, it’s spread by beekeepers, drifting worker bees, and robber bees — often accompanied by killer wasps — who steal dangerous, spore-laden honey or bee bread and bring it back to their broods. Its spores can't be seen with the naked eye, but they can remain viable for over half a century. Caused by the spore-forming bacterium Paenibacillus larvae, AFB poses a major threat to American honeybees — and by extension, to US agricultural systems that rely on them. It's worsened by other factors like loss of habitat, use of pesticides, and climate change. The disease doesn’t impact adult bees, but infected larvae turn chocolate-brown and melt into a gooey mass that looks like brown snot. “Once spores are in the midgut, the vegetative form of the bacterium takes over using the larvae as a source of nourishment,” says Rob Synder, a crop protection agent in Oroville, California. When the larvae dry out, they become black scales that are essentially glued to the hive’s floor. The scale from a single larvae can contain one billion spores. “It only takes 35 spores to trigger the disease,” says Spencer Gutierrez, the author of Beekeeping Secrets: 15 Facts You Need to Know That Will Save Your Life. When hives are infected, beekeepers generally treat them with FDA-approved antibiotics like tylosin tartrate and lincomycin hydrochloride. They control the disease’s symptoms, but they don't destroy its spores. Under a vet’s supervision, the substances are mixed with powdered sugar. Four-to-six weeks before the start of the main honey flow (usually in the spring or fall), the sugary-antibiotic mixture is dusted across the top bars of the brood nest frame: a removable cell that holds the colony’s eggs, larvae, and pupae. From there, the worker bees pass the drugs on to the larvae during feeding. American foulbrood poses a major threat to American honeybees. Infected larvae often turn chocolate-brown and melt into a gooey mass. Photo by Tanarus / Wikimedia Commons. To save nearby colonies from infection, beekeepers frequently destroy their hives. They plug their entrances with newspaper and cover their sides with masking tape. Then they pour unleaded gasoline onto the hives and set them on fire with a blow lamp. 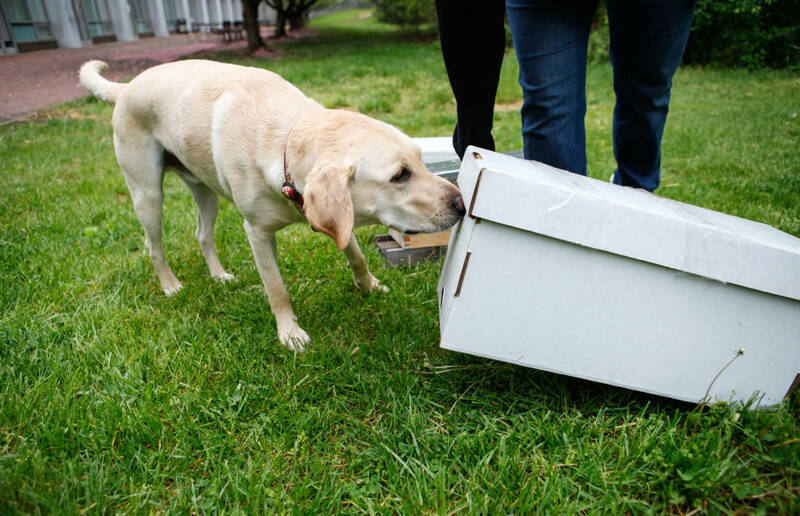 That’s where AFB-sniffing dogs come in — they make sure that infected hives are either isolated or destroyed. “Detection and quarantine processes are essential to save our bees,” says Josh Kennett, the owner of Australia's first apiary dog. It’s a big task for the canines to take on, particularly given declining honeybee numbers in the US: In 1947 there were an estimated 6 million hives, compared to today’s 2.4 million. The job also comes with some risks. 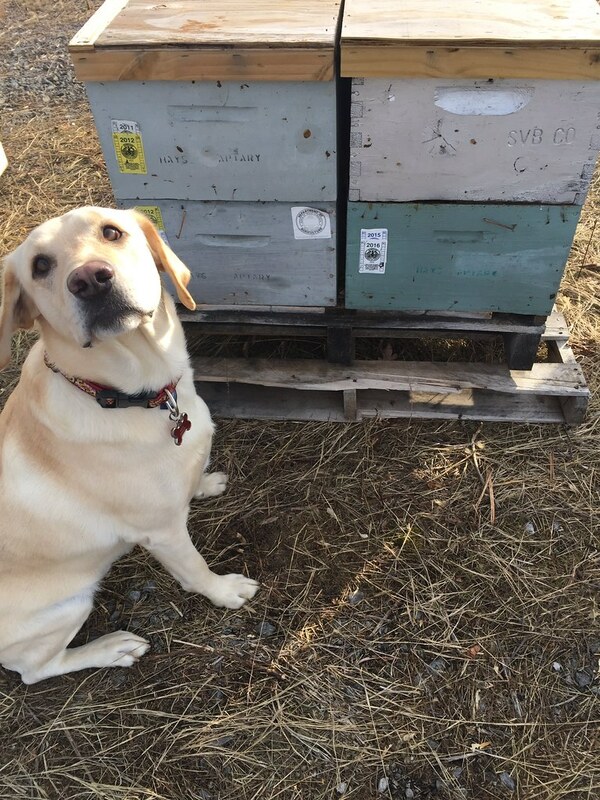 “[In 2013,] I realized that [my dog] Bazz was able to sniff out the disease, and save thousands of bees,” Kennet says. “But, he didn’t like being around them too much when he was getting stung.” Kennet designed the black Labrador his own beekeeper suit, which includes a homemade, mesh headpiece that’s similar to the cones dogs wear after a trip to the vet, only this one protects him from stingers. Mack sits in front of a beehive, a sign that he's detected AFB. Photo by Cybil Preston. Preston rescued Mack from a garage when he was a year-and-a-half old. When his family couldn’t care for him anymore, they called her. “I couldn’t resist,” she says. “I had to take him. I saw how cute he was.” While he’d been housebroken, he wasn’t fixed and was kind of wild, pouncing on people at the door. Preston taught him basic commands. Then she partnered with Mark Flynn, the K-9 unit commander at the state’s Department of Public Safety and Correctional Services, to complete an eight-month training program. Whether dogs are searching for contraband cell phones, illegal drugs, or foulbrood in beehives, Flynn looks for the dogs that’ll jump into the water to get the ball, the ones completely obsessed with their toys. “Because when a dog is searching, he believes in his heart he’s trying to find his toy,” Flynn says. Mack wasn’t motivated much by toys. “But there’s this phenomenon where you can actually build up the drive in a dog,” he says. And through reward, repetition, and play — wrestling, throwing balls, and tug of war — that’s what Preston did. Using rubber gloves, she also saturated his toys and blankets with AFB-infected honeycomb. “I did this indoors to decrease the chance of environmental infestation,” she says. There are about 9,000 honeybee colonies scattered throughout Maryland. A single healthy colony may hold around 60,000 bees in mid-summer, 30,000 bees in the late fall, and closer to 20,000 by the end of the winter. Mack is cost-effective for Maryland. He only works in colder weather, usually from November to March, because bees are dormant or clustered when it’s below 54°F. On long summer days, when the hives are busy with bees flying in and out to forage, Mack won’t even budge from his bed in the van. Preston still hides his training aids, and she runs drills to keep him on his toes. “When we're not [training], he's either swimming in the pool or sleeping on the couch. He's a Lab so he does that hanging out thing very well,” she says. Preston, Mack, and Tukka — a young springer spaniel who’s still in training — are currently on the front lines, securing our country’s food supply. Grains are primarily pollinated by the wind. But fruits, nuts, and veggies — which comprise 70 of the top 100 human food crops — are pollinated by bees. That’s why beekeepers follow the bloom. For six months a year, they travel with their bees to fruit, vegetable, and nut farms in need of pollination. Cherese Cobb is a professional writer and photographer from Maryville, Tennessee. When she's not pinning copy for newspapers, blogs, and magazines, she splits her time between family, nature, and cat-worship, and chugs coffee to survive all three. Find her online at @cherese_cobb.